Sitting around the table last October in Florida as we watched the latest news on Hurricane Sandy - and what effects she would have on the Major League Fishing 2013 Challenge Cup event I was covering - the conversation between Kelly Jordon and yours truly eventually turned to whitetails. Like many other bass pros, the Palestine based Major League Fishing angler and Bassmaster Elite Series competitor is as passionate about his deer hunting as he is about catching America's favorite fish. Especially when it comes to chasing Muy Grande sized whitetails on the two Webb County leases that Jordon hunts every fall. "Hey Burkhead, what are you doing a couple of months from now?," queried KJ. "Want to come help me do some management work? The biologist says we've got a lot of does we need to take this year and a few cull bucks too." "Sounds like fun," I replied. "But if you don't mind, I'd rather bring my two sons and let them do the heavy work." And just like that, a South Texas deer hunting adventure was born. Now fast forward to December when the Burkhead clan - me, my oldest son Zach, and my youngest son Will - all rolled into Jordon's deer camp just three miles from the Rio Grande River. As we quickly changed into our Realtree Max-1 hunting gear - the perfect pattern for South Texas - we were all three mesmerized by what we had seen so far of the fabled Brush Country. 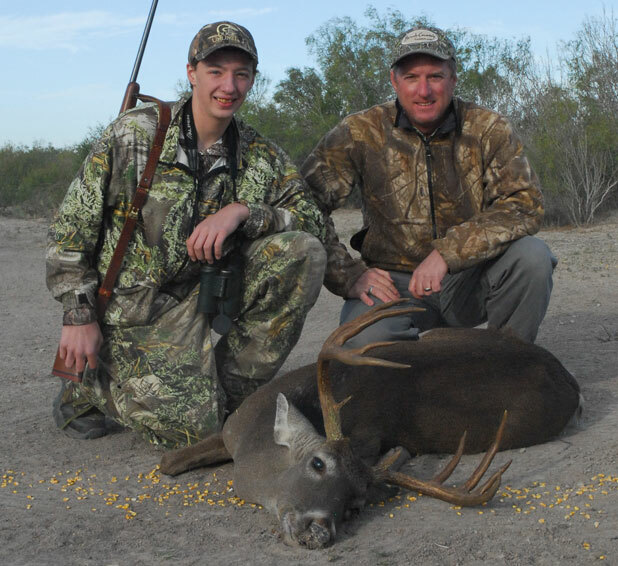 Dotted with massive ranches and tiny outposts of civilization, it's a wind-swept land rich with mesquite trees, prickly pear cactus, protein-rich thorny underbrush, and arrowhead dotted senderos (paths cut through the brush) that produce some of the best whitetail head-bones in the entire world. With Jordon guiding one of my sons and his friend Jimmy Campbell guiding the other, I was quickly dispatched to a bow blind to try and fill a tag or two with my BowTech Insanity compound, the very best bow I've ever shot. Before long, I had a couple of big antlered bucks tempting me to release an arrow. There was just one problem - the mid-150 class 11-point buck and the last-light monster with mule deer like forked G-2 tines - didn't meet the management criteria I was hunting under. So I sat back and enjoyed the show. Especially the act put on by the dozens of mourning doves and blue quail that scurried about hoping to grab a few kernels of corn before the deer gobbled it up. By evening's end, the first meat was headed for the family freezer after Zach downed a doe and Will nailed a wild hog with some nasty looking cutlery protruding from his snout. That scenario would repeat itself several times on the dusty MLD properties we hunted on, Jordon's 8,000-acre lease and the similarly sized northern Webb County ranch that is owned by former Texas Parks and Wildlife Commissioner Donato Ramos and managed by Houston oil businessman Chris Mahfouz. By the end of our hunt, a good amount of management work had been done by the Burkhead clan and a hefty supply of venison was chilling for our trip back north towards the Red River. With several does taken between us, there was ample opportunity for my two sons to perfect their deer processing skills. But not their deer caping skills since neither Zach or Will had encountered a trophy-size management buck. It wasn't for lack of seeing bucks, mind you. Both boys saw a number of bucks that would be shooters anywhere in the world. Except for a well managed South Texas ranch where you don't pull the trigger on a buck until he's either old enough or he has shown that he will not outgrow undesirable antler characteristics. So the young 10-point I rattled in to a distance of 15 yards got a free pass. As did the 4 ½-year-old 150-ish 12-point that hung around Zach's stand for 45 minutes. Ditto for the big 160-plus 12-point that Will glassed for the better part of a half-hour. Even the trip's biggest bruiser, a massive 170-ish whitetail that Zach dubbed the "Realtree Buck," walked away since KJ couldn't recall for certain if he was on the pre-season "Shooter List." But finally, on a muggy December dawn as low clouds raced northward across the South Texas sky, Will got his chance when a bullish 8-point buck cleared everything out from under the feeder. After careful consideration, Will got the green light to let a round fly downrange at the 6 ½-year sendero bully. The shot from the 6mm was true, the buck took a couple of final staggering steps, and suddenly my taxidermy bill was only beginning. 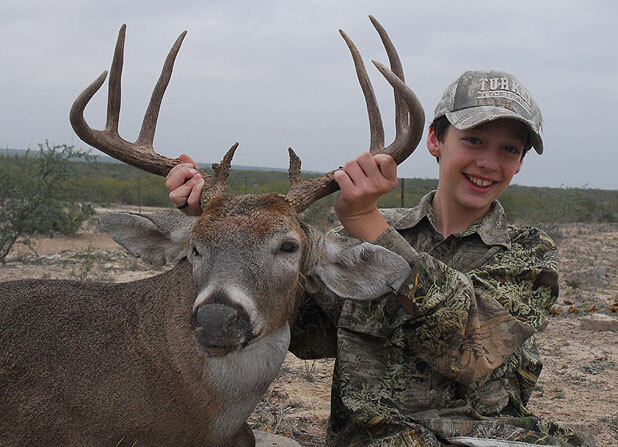 Will Burkhead shows off his 8-point South Texas management buck. By the last morning of our hunt, the stiff southerly breeze had flip-flopped as an overnight blue norther ushered in chilly temperatures in the lower 40s. As we left Ramos' warm and comfortable hunting camp and headed down miles of bumpy ranch roads towards a couple of Chihuahua ranch tower blinds, everyone was silent as Zach prayed for a last second chance. Fearing that my son would be feeling the pressure to succeed on his bottom of the ninth hunt, I had Zach hunt with Jordon that morning since I knew KJ would keep him loose and laughing no matter what the outcome. As Will and I sat hoping for a crack at a final management doe - or maybe a javelina - the sun rose and the minutes ticked by as I buried into my camo fleece. An hour into our hunt, the wind brought a faint, muffled report and I asked Will if he thought it was a shot. Turned out it was - Zach had tagged a management doe. By mid-morning, there was no additional word from KJ and Z-Man's stand. So I reluctantly began to mentally prepare the speech that dad's give to their kids when things don't go as planned or hoped for. Somewhere in the middle of writing that speech, I heard another faint noise from the north. Was it a shot from the .270 WSM that Zach was toting? Neither Will or I could tell as the wind rattled our tower blind. But a couple of minutes later, we got our answer when my I-Phone buzzed and delivered an excited text from Jordon: "BIG BUCK DOWN!" A short while later, a very happy reunion commenced as the four of us admired the fallen monarch that had virtually no teeth left and was at least 8 1/2 years old. Older brother Zach Burkhead (left) shows Kelly Jordon that he isn't to be outdone after downing a 10-point Brush Country bruiser. As I sat behind my Nikon snapping photos of my beaming elder son and his last second 10-point buck, I silently thanked the Lord for the incredible privilege and opportunity to raise - manage, if you will - the two "young bucks" that He has entrusted into my care. And for a hurricane born adventure that allowed those two sons to experience the magic of the Brush Country while felling a couple of old geezer bucks on a deer hunt that will never be forgotten. Deep in the heart of whitetail rich South Texas where the dusty, windswept cactus country gives way to the rolling Rio Grande.